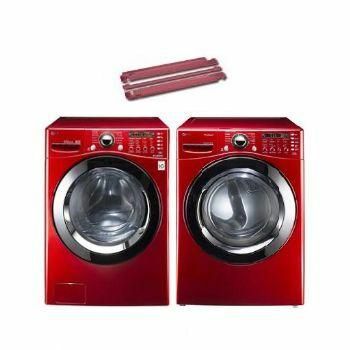 For this week's Frivolous Friday, I'm going to write about my dream of having bright red laundry machines. I love red. Red makes me happy. But, I can pretty much guarantee that it will never happen. Coloured washing machines are unbelievably expensive...being at least $500+ more than plain ol' white machines. Who knew? Probably everybody. Shush. We thought we had found a set on sale in our price range. I was delighted! I had images of bright red machines in the corner of the room, and the back side of the door painted a matching bright red so that people would be like "Woah!" when they closed the door. Our laundry machines have to go in our bathroom, which is why visitors would ever be in the same room as the laundry. But, it was not to be. So that dream has died. But white will do. It's clean and bright and leaves a lot more room for colour choices!